Signing up for LinkedIn is free, and many functions are open to all account holders, so you can take advantage of most of the opportunities that LinkedIn offers. You can pay a monthly fee for a premium account to get additional functions or communication options. Finally, tailored solutions are available for corporations that want to use LinkedIn as a source for hiring quality candidates. There’s not much difference between a free account and paid account on LinkedIn. And the basic account is anything but basic in usage. 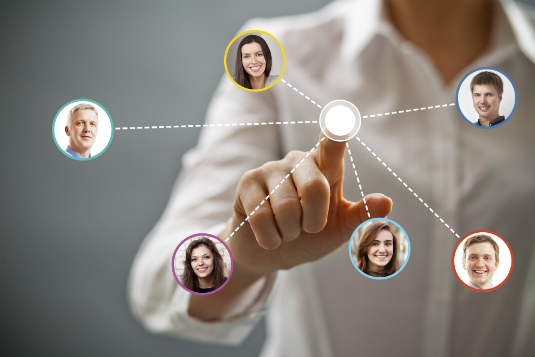 LinkedIn offers a few levels of paid accounts, each with a specific level of benefits. 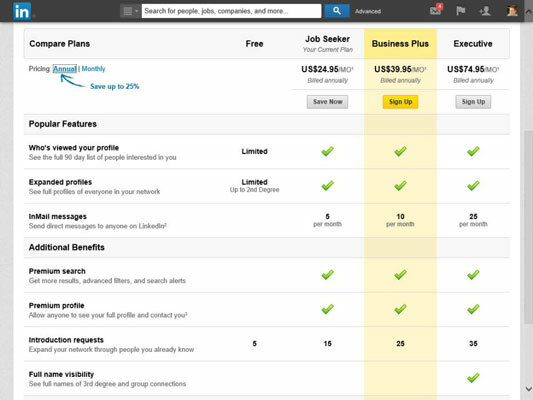 For the most up-to-date packages that LinkedIn offers, check out the Compare Accounts Type page. You can also click the Upgrade link at the top right of your screen, below your Account & Settings button (the thumbnail of your photo), to see a comparison of the paid accounts. Five InMails per month, with a seven-day response guarantee that states that if you don’t receive a response to your InMail within seven days, you will receive that InMail credit back. Expanded profile views and a total of 250 search results outside your network when you search. Fifteen introductions that you can use to have your connections introduce you to their connections. Ten InMails per month, with a seven-day response guarantee. (Unused InMail credits roll over each month, up to a maximum of 30 credits. Expanded profile views and a total of 500 search results outside your network when you search. Twenty-five introductions that you can use to have your connections introduce you to their connections. Twenty-five InMails per month, with a seven-day response guarantee. (Unused InMail credits roll over each month, up to a maximum of 30 credits. Expanded profile views and a total of 700 search results outside your network when you search. Thirty-five introductions that you can use to have your connections introduce you to their connections. Full name visibility when looking at your third-degree network members or group connections (other plans display only limited name information for these people). What’s the value in getting a premium account? Besides the features already listed for each account level, premium accounts are designed to give you more attention in areas like job search. When an employer lists a job posting and collects applications through LinkedIn, premium account holders show up at the top of the applicant list with a LinkedIn “badge” next to their name. LinkedIn provides special content in the form of e-mails, video tutorials, and articles that provide job search and professional development tips and advice from leaders in the industry. Finally, you get to see who has viewed your profile, which can be helpful when you’re applying for jobs or trying to set up business deals. Consider what you need from your LinkedIn experience and decide if upgrading is right for you.